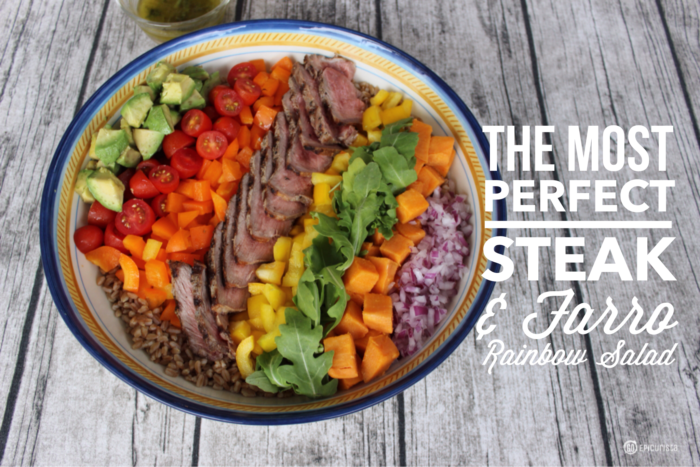 Time to get Inspired by Beef with the most perfect Rainbow Salad ever! 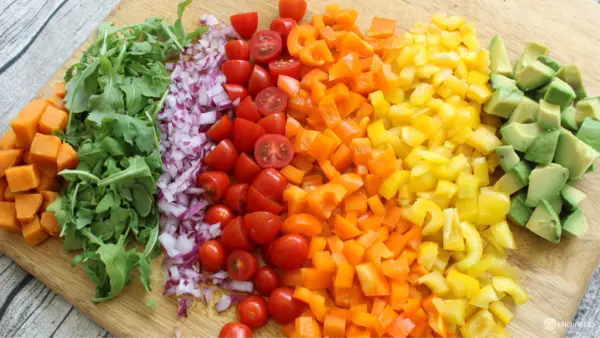 Want to know how to create the most perfect rainbow salad ever? You can actually call this a bowl because that’s the latest food trend now. (Salad has always been served in a bowl at my house, so who knew, we’ve been trendy all along!) Anyways, my meal planning dilemma led me to creating this most perfect rainbow salad (bowl) and here’s why. I’m convinced my husband may be Fred Flintstone’s long lost cousin (I say this with profound and absolute affection). He truly is happiest with a huge brontosaurus-sized steak overtaking the entire plate. As for me, I find it a bit boring. And, there’s my meal planning dilemma. 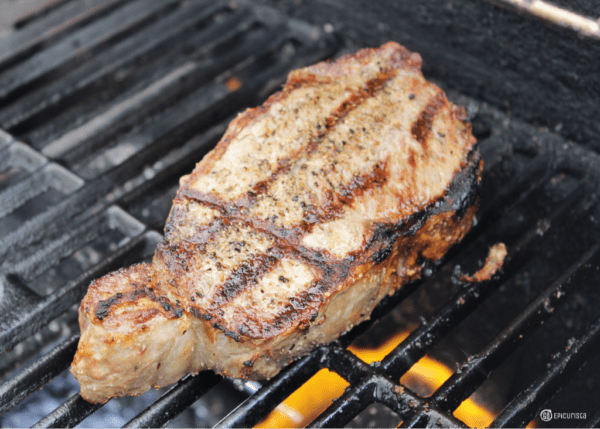 This gorgeous 16oz Grilled New York Strip would be the ideal dinner for my husband. No need for anything else on the plate. Let me explain. I prefer to see my plate full of different colors and textures. I like a fun plate. I like variety. I want a small taste of different foods rather than copious amounts of just one, even if it’s a glorious steak. Variety is great in a meal (plus I think it’s healthier too). This male vs. female eating habit presents a challenge. How to create a dish satisfying for both of us? The Florida Beef Council inspired the solution. Yes, Beef inspired the creation of the most perfect rainbow salad ever. How did Beef inspire the most perfect rainbow salad ever created? As part of my Florida Beef Immersion Experience in Gainesville Florida, a small college town best known as ‘The Swamp’ – home of the University of Florida, I have learned about all things related to Florida Beef. Visits to the UF Animal Sciences department, checking out a commercial cattle ranch and talking to people in the industry including cattle ranchers, chefs and butchers has been fascinating. Follow Go Epicurista along on Facebook, Twitter and Instagram for all the fun details. 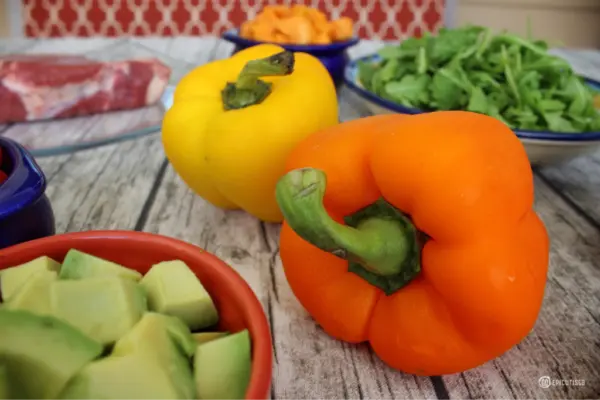 Inspired and challenged by the Florida Beef Council to create a recipe showing how beef can compliment a dish with added nutrition, rather than simply be the main focus on the plate, I set out to create a perfect salad or rice bowl. I’ve been touched and inspired by all the rainbow signs and positive messages I’ve seen around my hometown of Orlando these past few months. 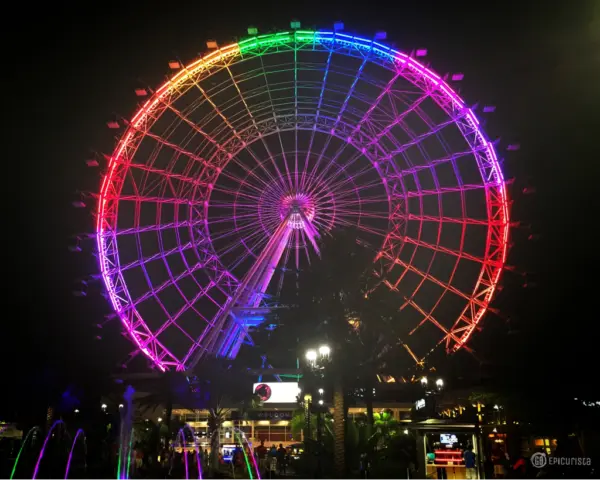 It is still profoundly sad to think of the Pulse tragedy, but the response from our community continues to give me hope for better days and isn’t that what a rainbow does? Offer a bright colorful sign of hope after the gloomy rain? A Beautiful Rainbow in Orlando! This bright sign of hope gave me the idea on how to solve our dinner dilemma. Why not create a rainbow on a plate? A plate full of different textures and colors that would be filling and satisfying for everyone. The Beef and Farro Rainbow Salad was born. It was perfect and absolutely delicious. 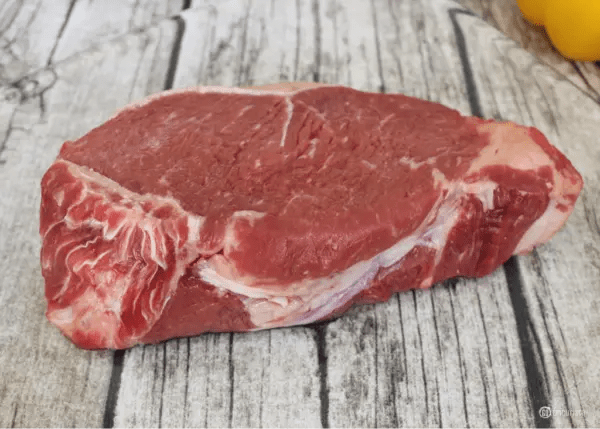 My husband was happy with the great flavor of the beef – I used a New York Strip which is lean yet has a bit of texture and fat to add that distinct comforting flavor beef lovers love. Isn’t this New York Strip beautiful? Plus, with all the different veggies and farro grains, there was a lot of chewing involved, filling him up sooner. He didn’t miss the Brontosaurus steak at all! 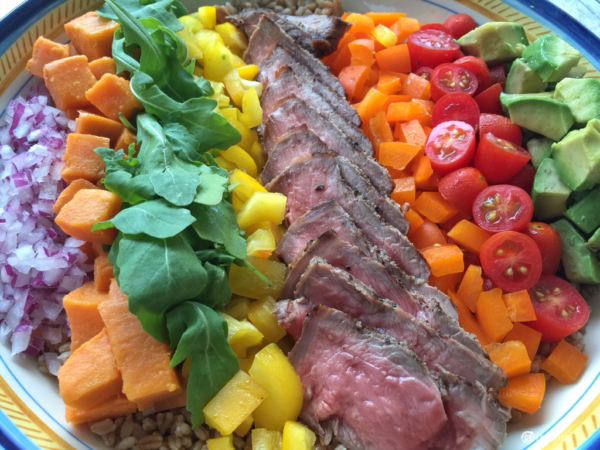 Here’s my Top 9 reasons why we loved this Beef and Farro Rainbow Salad and why I think you will love it too. You could also say these are 9 Reasons why you need this Beef Rainbow Salad in your life. Seriously! 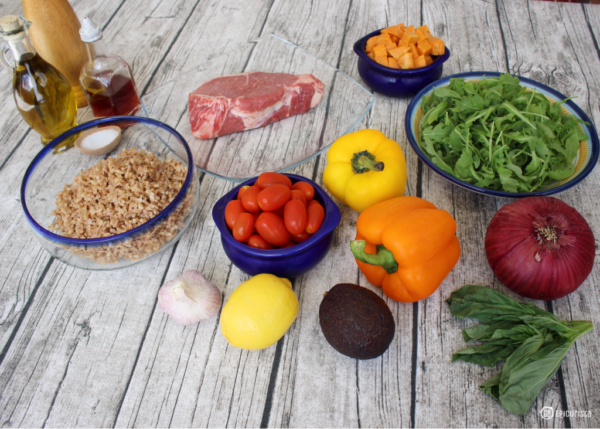 9 Reasons This Beef and Farro Rainbow Salad is the most perfect salad ever created! Just look at all this color! Doesn’t it make you happy? Rainbows come after the rain and this salad is sure to cheer you up. I’ve always heard you should eat as much food of different color as possible and all the colors of the rainbow are represented in one bowl! This is a happy dance in my mouth for sure. This salad can easily be a side dish or the main event, especially with the addition of beef. It provides additional richness in flavor and contrast in texture. A small amount of beef goes a long way, even to satisfy my husband’s carnivorous appetite. 3 to 4 oz can be used as a flavor enhancer or as a protein boost to your snack or meal. Thinly Slice this Strip , enough for 4! 3. It’s Easy To Make! 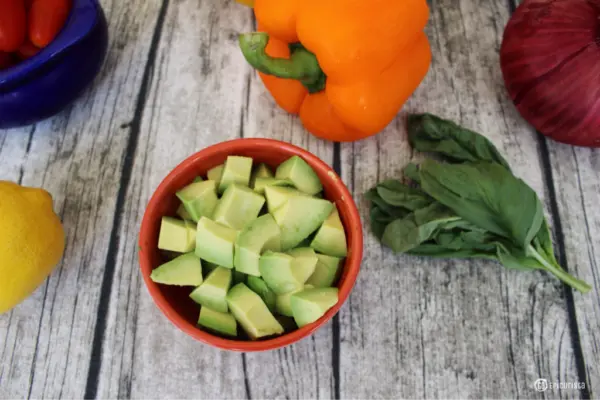 With ingredients you can find easily in your grocery store, and such easy preparation, you can have this salad any time. There’s no need for complicated recipes and measuring ingredients. In the rainbow, all colors are equal so put in the same amount of each ingredient and love them all the same. You can easily increase or reduce quantities based on the number of guests. Practically any vegetable will work in this salad, as long as you like it, use it. The combinations are endless. Rainbows span a continuous spectrum of colors. Next time you’re at the grocery store, just pick something in each color you see. Red, orange, yellow, green, blue, violet. You could use purple potatoes, sweet corn, radishes, spinach, cucumber, and so much more. As far as the beef goes, I stick to lean cuts like New York Strip and Top Sirloin but I also love a nice outside skirt steak (churrasco). When it comes to salads, I’ve always been a “throw anything you find in the fridge” in a bowl kind of girl. You got half a tomato, half onion, half a potato, use it. Chop it up and throw it in a bowl with leafy greens like spinach or arugula or a grain like quinoa or farro (my favorite). With the addition of 3 oz of lean beef, it becomes a filling meal. This could be your new “clean out your refrigerator” salad. This one bowl not only looks pretty but it can easily feed a crowd for any type of gathering, potluck event or picnic. It’s served at room temperature so no need to worry about keeping it chilled thought the event. ^ Does it look pretty? (check). ^ Is easy to make? (check) You just chop the veggies, boil the farro, grill the steak, and done. ^ Does it provide sustenance and fill you up, especially when alcohol is being served at the party? (check). ^ Is it versatile? (check) This salad can be a side dish or main dish. ^ Can it be prepared ahead of time so you don’t have to be running around during the party? (check). I think the salad gets even better once it sits for a bit, and even the next day, as the vegetables and farro absorb the dressing. There’s a perk to making this ahead of your party. Leftovers will keep in your refrigerator for a few days and it makes for a quick lunch or afternoon snack. Make enough to last you a few days and you won’t regret it. I add a squirt of fresh lemon juice before serving leftovers to “wake up” the fresh flavors. 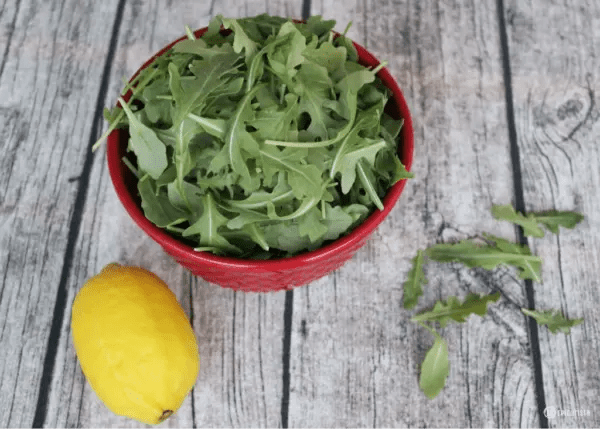 Add some fresh arugula and lemon juice to Rainbow Salad leftovers to brighten them up! Salads are great but unless you add a bit of protein, you’ll be feeling hungry – or “hangry” in my case – in no time. One serving of beef, found in this salad, meets 50% of your recommended daily value of protein. 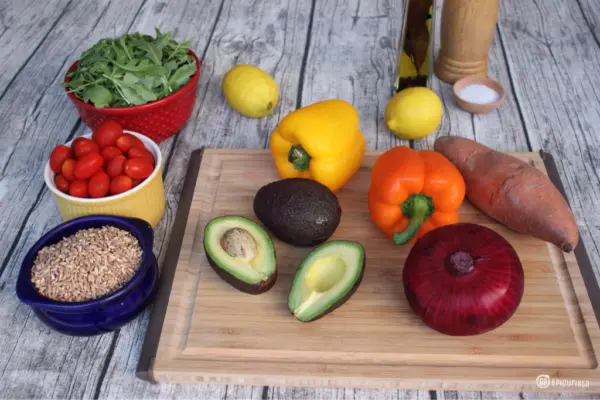 Adding a whole grain, like farro, which has 5g of fiber per 1/4cup serving, plus lots of crunchy veggies, means you’ll be pleasantly full until your next meal. 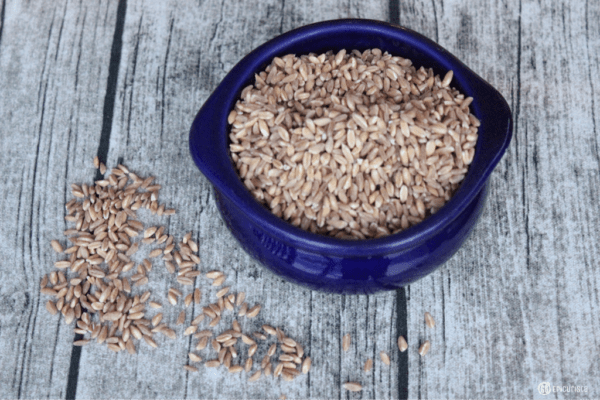 Pearled Farro helps fill you up! Although the salad has lots of ingredients and it is filling, it is still light in flavor from the bright lemon basil vinaigrette with fresh garlic. The dressing does not overpower the veggies and adds a nice flavor contrast to the beef. 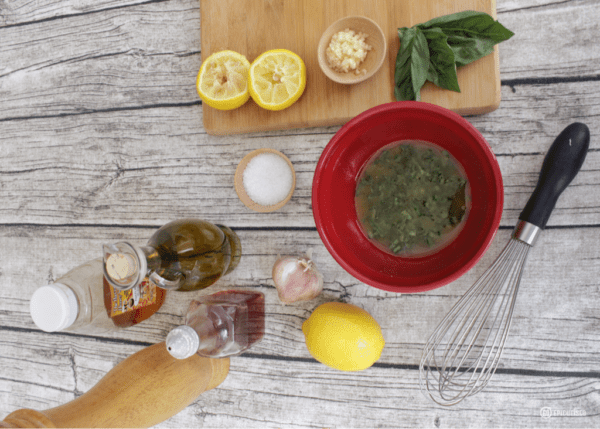 It is the quintessential Mediterranean diet dressing. 9. It’s Good For You! This is the most important. I’ve heard repeatedly how important it is to eat colorful foods. I don’t know where I heard it but it makes sense. The more colors on your plate, the more nutrients, vitamins and minerals, right? This salad has all the colors. Plus, a single serving of lean beef, which is 3 ounces (approximately the size of a smart phone), has an average of 150 calories and less than 10 grams of fat. Not only does beef provide complete, high quality protein, but also contains high amounts of zinc, iron, and vitamins B6 and B12, along with other key vitamins and minerals your body needs. The combination of vegetables, grains and the light dressing make this an excellent source of many nutrients. There you have it. I hope you’ll go make yourself the most perfect rainbow salad ever created and enjoy all the colors of a beautiful rainbow. 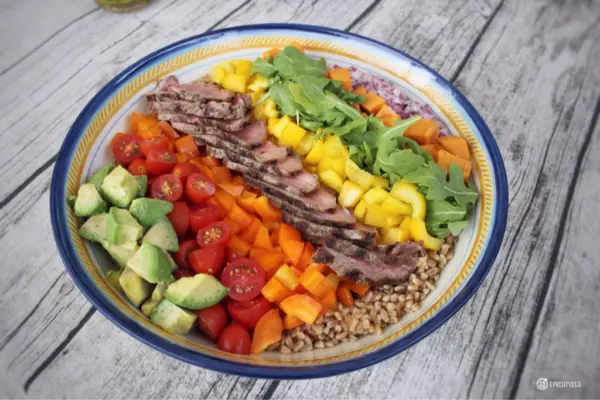 This Beef and Farro Rainbow Salad is happiness in a bowl. Here’s More Great Beef Recipes! For more great beef recipe ideas, check out the Sunday Supper Tastemakers links below. Beef doesn’t have to be the main ingredient and these recipes prove it. For more news and information on Florida Beef, check out their website and follow them on Facebook, Instagram, Pinterest, Twitter, and YouTube. Disclosure: This post is sponsored by Florida Beef Council in conjunction with a social media campaign through Sunday Supper LLC. All opinions are my own. The most perfect Rainbow Salad ever created! Lots of fresh, crunchy colorful veggies, pearled farro and lean beef combine for a side dish or main event salad that's a party in your mouth! Rub steak with garlic salt and fresh pepper to taste, or use your favorite steak rub. Let your steak sit at room temp for 5 minutes before placing on the grill. While farro is cooking, grill strip steak on preheated gas grill, 7 to 10 minutes. For medium rare (145°F) to medium (160°F) doneness, turn only once. 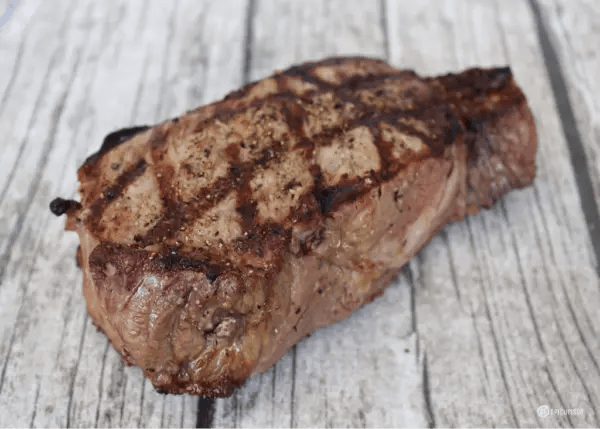 Remove steak from grill and let it rest for minimum of 5 minutes. (This is the trick for a juicy steak) Then, carve into thin slices. Toss cooked farro with half of the dressing, season with salt and pepper to taste. Place farro on the bottom of large bowl, spread out to cover the bottom of the bowl evenly. Arrange all ingredients,including beef, in rows on top of farro, alternating colors. The bowl will look like a beautiful rainbow on your table. When it’s time for serving, toss all ingredients with remaining dressing. The grill marks on the steak, paired with the gorgeous colors of this salad have my mouth watering! Thank you Katie! That steak is definitely drool-worthy!